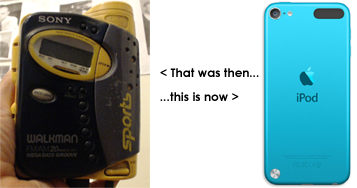 June 2013: How many people remember strapping a Sony Walkman to their upper arm…the size of a brick…to go for a jog around Central Park and feel as if it were coolest thing on earth? If you got mugged, all you had to do was zap the offender with the Walkman to knock ‘im out. Well that was then and this is now. In 1958, Kilby’s microchip was the size of your pinky and had a single transistor, three resistors and a capacitor. Today, the average microchip is penny-sized, if not smaller, and can hold as many as 125 million transistors. Computing continues to speed up. When it comes to covering a live performance with multiple cameras and streaming it to the Internet, our grown-up kids in 10 to 20 years (if not sooner) will be saying: That was then, this is now. Wires and cables will be obsolete – a laughable remnant from a bygone age. No plugs, no wires, no adaptors. Everything will be wireless. Why bother with a projector when the wallpaper is smart? Wave your hand – huzzah! The wall lights up and projects an interactive live video stream from any city in the world. In 2013, we’re still figuring out which adaptor to use to hook a MacBook Pro to a projector. 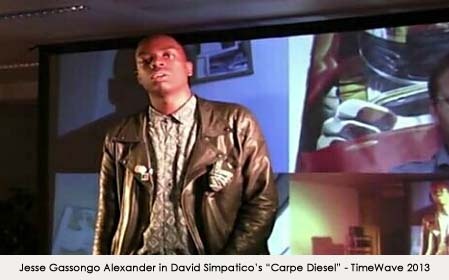 New York-based playwright, David Simpatico, has written a dark comedy, “Carpe Diesal,” about three American copywriters who are creating advertisements from news coverage of riots and uprisings. The four-part serialized format begs the question: can this era be defined as the commercialization of injustice and discontent? Dylan Southard, the co-founder of LA-based Needtheater and member of LoNyLa LA, has always had an interest in the intersection of theatre and new technology. He wanted to dive into a piece and develop it with an eye on using technology in an interesting way. Simpatico is a quick and flexible writer. He was game for developing what was originally a ten-minute piece into a four-part series evolving over the course of the festival. The play naturally involves multiple, if not conflicting, perspectives with the potential of branching story lines. The next step was to link Los Angeles and London via the story and not just technology. In other words, content intertwined characters on both sides of the pond. It’s not just a case of streaming in material from a remote location. Technology then serves the story in a back-and-forth exchange between characters in the two cities. Once the story was developed, the next step was to figure out the tech requirements to bring the format to life. Each day of “Carpe Diesal” presents a particular set of technical challenges. For example, the three copywriters view and riff on live coverage of riots. The question: how do we crop and stream YouTube videos into the telepresence platform? Dylan and David came up with a diagram on how to accomplish this feat and sent it to Dakota, who is handling the broadcasting of TimeWave. She took one look at the diagram and had to grin. That was then, this is now. We don’t need to point a camera on a computer screen to film a YouTube video. That’s already one camera too many. Both Vidyo and Wirecast have desktop capture capabilities. You don’t need any external devices. The exercise of figuring out how to use new technology to stage a live performance is the leap. In some cases, live theatre should be what it’s always been – an intimate experience without gadgets or gizmos or any whizz-bang tech. The human mind is perhaps the most sophisticated piece of computing machinery that exists. TimeWave will present plays that don’t need new tech. Some plays that will be streamed in to London are best served by traditional ways of making theatre. 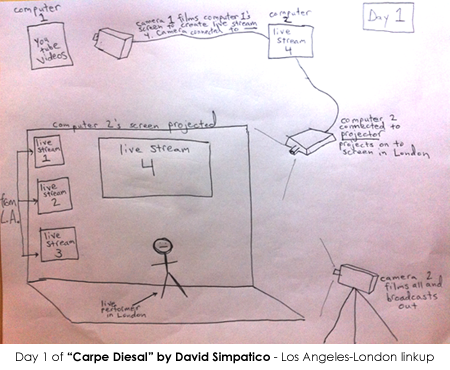 In the case of Carpe Diesal, the use of technology expands the original story in startling and fresh ways and links talent in two major cities in real time.